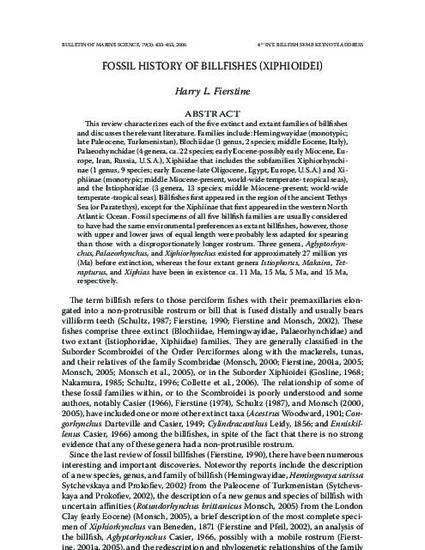 This review characterizes each of the five extinct and extant families of billfishes and discusses the relevant literature. Families include: Hemingwayidae (monotypic; late Paleocene, Turkmenistan), Blochiidae (1 genus, 2 species; middle Eocene, Italy), Palaeorhynchidae (4 genera, ca. 22 species; early Eocene-possibly early Miocene, Europe, Iran, Russia, U.S.A.), Xiphiidae that includes the subfamilies Xiphiorhynchinae (1 genus, 9 species; early Eocene-late Oligocene, Egypt, Europe, U.S.A.) and Xiphiinae (monotypic; middle Miocene-present, world-wide temperate- tropical seas), and the Istiophoridae (3 genera, 13 species; middle Miocene-present; world-wide temperate-tropical seas). Billfishes first appeared in the region of the ancient Tethys Sea (or Paratethys), except for the Xiphiinae that first appeared in the western North Atlantic Ocean. Fossil specimens of all five billfish families are usually considered to have had the same environmental preferences as extant billfishes, however, those with upper and lower jaws of equal length were probably less adapted for spearing than those with a disproportionately longer rostrum. Three genera, Aglyptorhynchus, Palaeorhynchus, and Xiphiorhynchus existed for approximately 27 million yrs (Ma) before extinction, whereas the four extant genera Istiophorus, Makaira, Tetrapturus, and Xiphias have been in existence ca. 11 Ma, 15 Ma, 5 Ma, and 15 Ma, respectively.